No snails were harmed in the making of this product! The vitamins enriched firmula has a complex impact, assisting in the promotionof healthy and beautiful skin. The fat soluble type of Vitamin C used in the product boosts collagen production, reduces melanin synthesis and brightens dark spots. Vitamin B5 (Pantothenic Acid) speeds up physiological cell regeneration, facilitates cellular structures synthesis, and soothes skin irritation. Vitamin E is a powerful antioxidant which binds free radicals and normalizes skin cells and skin tissues metabolism. 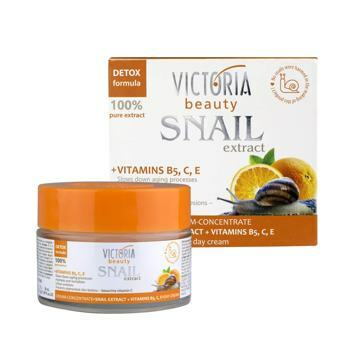 Snail extract is rich in collagen, elastin, low-molecular-weight hyaluronic acid, and phyto antibiotics. Daily use of the product nourishes and deeply hydrates the skin, protects it against environmental damage. The complex actions of the product shows down the aging processes. Store in a dry place at temperatures below 25C, protected from direct sunlight.